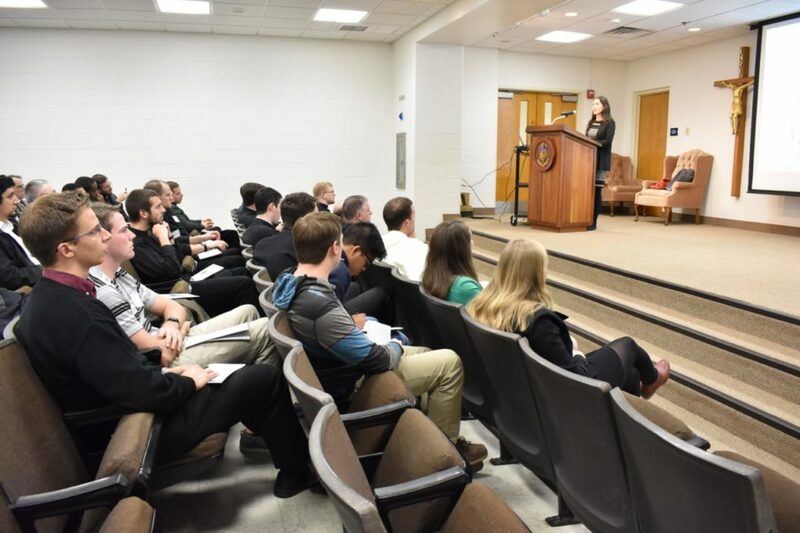 October 26 – 27, 2018, St. Charles Borromeo Seminary – WYA North America partnered with St. Charles Borromeo Seminary (Philadelphia, PA) and the Thomistic Institute to host its Fall 2018 Emerging Leaders Conference. Entitled “The Person and Bioethics: Defending the Dignity of the Human Person in Modern Medicine”, the conference explored end of life bioethical issues through the lens of human dignity. It featured eight outstanding speakers who provided an in-depth and comprehensive study of Bioethics in relation to the philosophy of the human person. Speakers spoke based on expert experience and studies in the areas of philosophy, law, and medicine. On Friday night, keynote speaker Dr. Lydia Dugdale, MD (Yale School of Medicine) presented the issue of euthanasia. Her keynote address, “Therapeutic Dying and the Art of Dying Well” outlined key historical and current events as well as important cultural dimensions that contribute to the way society approaches death. On Saturday morning, Dr. Michael Rombeiro, PH.D (St. Charles Borromeo Seminary Department of Philosophy) led the conference’s study of philosophy in his address, “Why Arguing about Moral Issues Seems Futile: Getting at the Heart of Moral Disagreement“. He explored key philosophical concepts that are important for an effective and person-centered analysis and response. His presentation demonstrated the importance to understand objective truths about the human person so that persons can effectively dialogue and respond to bioethical issues. The conference engaged 50 participants from various institutions and universities including: Villanova, Drexel, LaSalle, Children’s Minnesota Hospital, University of Pennsylvania Children’s Hospital, and St. Charles Borromeo Seminary. WYA is grateful to all conference speakers, partner organizations, and participants for their contribution to the conference. It was a great pleasure for WYA to engage the Philadelphia community in these important discussions that pertain to the dignity of the human person.